For Historic Properties, Museums, Schools and Events. 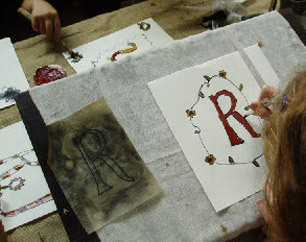 Using traditional materials and equipment, make an illuminated letter from authentic parchment letters or an illuminated picture to take home, decorated with egg tempera paints, quills or reed pens and ink. This is authentic from the 7th century through to late medieval or Tudor illumination. We call it ‘Painter’s Alchemy’ as it is a magical experience and it includes medieval pigments and semi-precious rocks. Created with Jack Greene we even made the brushes, pencils and pottery palettes. Plaster angels and Felt angels – derived from twelfth through to seventeenth century examples found in churches. 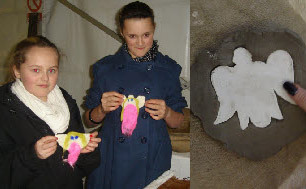 Children love to cast an example in plaster and to create their own unique textile angel to take home. We have encountered many angels on our travels – these are some of them. With an added ‘urgh’ factor! Did you know that face pots or ‘witch pots’ were concealed in buildings and filled with urine, hair and finger nails, to protect the house against witchcraft? This is the intriguing subject of this workshop, with a talk and display of concealed finds in buildings and ways that the Tudors and Stuarts protected both themselves and their houses from harm. 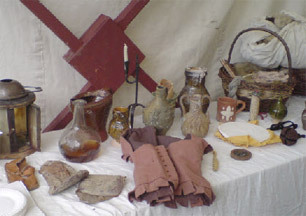 With examples of shoes, clothing and more ghastly materials that were once thought to provide magical protection to the home in the days before household insurance! 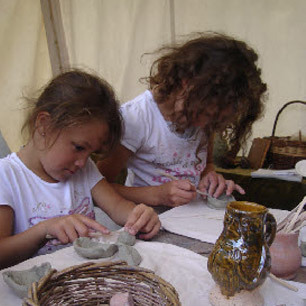 Children can make their own example of a ‘witch pot’ in clay to take home and paint when dry. 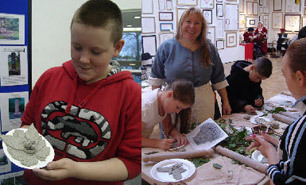 Popular with adults and children, this is a workshop which has both a medieval theme and also a modern environmental message. We have run this workshop in schools and libraries, museums and large marquees for summer arts events. Always creative and very popular with families. Children love to make faces out of leaves and they are all unique!